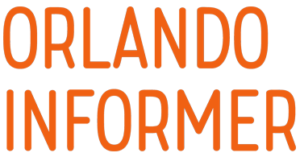 Welcome to Orlando Informer’s coverage of Universal’s Endless Summer Resort – Surfside Inn and Suites, the first value on-site hotel at Universal Orlando Resort (not to be confused with Cabana Bay Beach Resort and Aventura Hotel, which are prime value properties). We’ll be expanding and updating this page as we inch closer to the new addition’s grand debut, which is June 27, 2019. There are two very important items to keep in mind when discussing this new hotel. First and foremost is its location: it is being built on a 64-acre plot of land that used to house Wet ‘n Wild Orlando, the 1977 water park that Universal purchased in 1998 (and demolished in 2016) – meaning it’s a good five-minute bus ride away from the main Universal Orlando campus. While this might seem like a bit of a drive, it’s actually not that much longer – if any at all – than the trip from Cabana Bay Beach Resort to CityWalk and the two theme parks, which form the heart of Universal Orlando. Secondly, Surfside Inn and Suites is part of the overarching Endless Summer hotel complex, which will also consist of Dockside Inn and Suites starting in May 2020. Once this sister property is up and running, all Surfside guests will have access to its additional slate of amenities, which will include a Starbucks and two more pools. 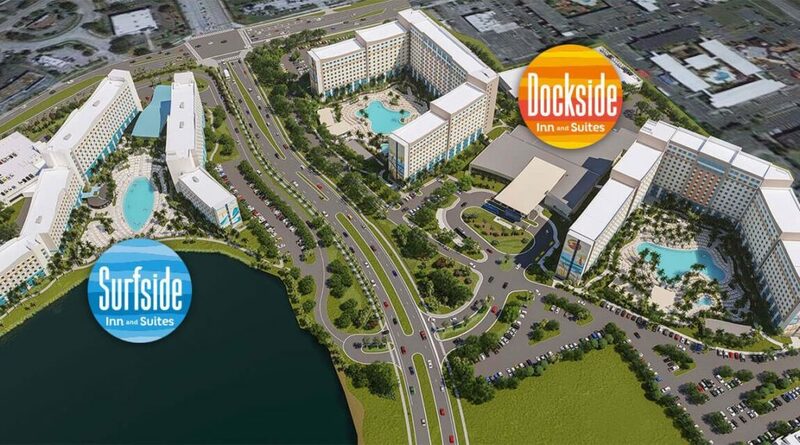 Surfside Inn and Suites will sit on the land that formally housed Wet ‘n Wild itself, while the larger Dockside Inn and Suites will occupy the space that was dedicated to the ex-water park’s parking lot and ancillary buildings (such as employee offices). As already noted, the two properties of Endless Summer Resort represent an entirely new category for Universal’s on-site hotels: value, which now joins the ranks of premier, preferred, and prime value. This may cause guests some confusion, so we figured we’d spend just a moment to clarify what the differences between the two value classifications are. 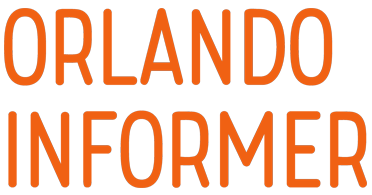 The “value” part of their designations means that, as one might expect, these four venues offer the most inexpensive room rates to be found all across Universal Orlando Resort. 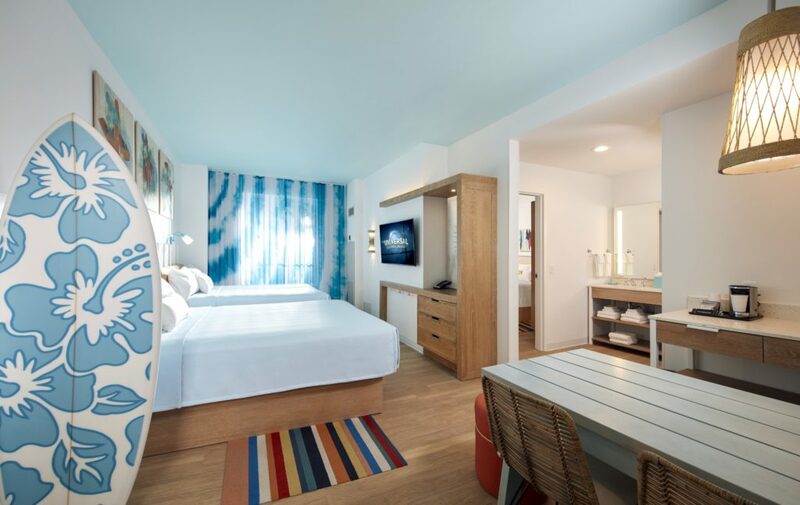 Where the “prime” part comes into play is in two benefits that both Cabana Bay Beach Resort and Aventura Hotel offer that Surfside Inn and Suites doesn’t (and, in fact, can’t): closer proximity to the theme parks and direct access, via private entrances, to Volcano Bay (which, if you’re planning on going to the water park, is actually a huge perk – waiting to be transported via shuttle can take a fair chunk of time, particularly if one does so from CityWalk as opposed to from any of the other hotels). Is Surfside Inn and Suites still an on-site hotel? Given that Endless Summer Resort – Surfside Inn and Suites will be sitting on its own little chunk of land out on Universal Boulevard, one is inclined to ask: is the new value hotel actually on-site? In a word, yes. Surfside will still offer the same level of theming and service that can be found at the other six Universal properties, along with – more importantly – the same bevy of benefits, such as Early Park Admission, resort-wide charging privileges, and package deliveries to your room. And as far as the distance from the parks and CityWalk goes, it actually is extremely comparable to that of Cabana Bay, with the only difference being what is on the land that lies between the hotels and CityWalk’s transportation area. Yes, this, in turn, will affect the walk from the new resort to Universal proper, but, then again, we don’t expect a number of guests to make that attempt in the first place – after all, most don’t walk from Cabana, and the company laid out a nice pathway for that very purpose. Because Surfside Inn and Suites is the single most inexpensive on-site resort – we’ll get to the specific rates in just a moment – the theming won’t be anywhere near as pronounced as what one can find at, say, Sapphire Falls Resort or Portofino Bay Hotel (although it should still offer up more than the minimalist-by-design Aventura Hotel, we should add). Expect to see a sun-and-surf vibe running all throughout the property, with a particular emphasis on the ocean, helping to form the place where “the sun, surf, sand, and water meet.” Universal says that the hotel is “washed in the colors of nature” and evokes a coastal lifestyle, thanks in part to the vibrant color palette, the towering exterior murals, and the neighboring lake, which should provide some pretty spectacular views from Surfside’s rooms. 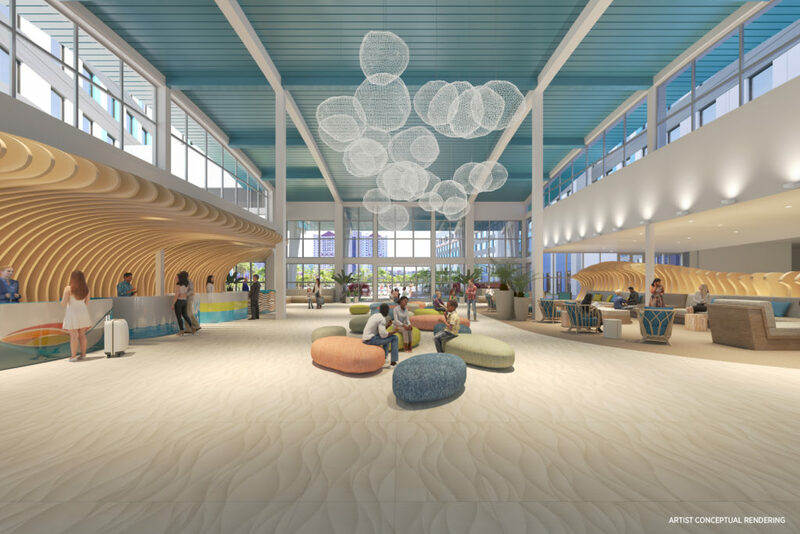 The big, open, and spacious lobby is meant to make guests feel as if they’ve entered the ocean’s depths, featuring “vibrant surf- and wave-like” designs, a sand-colored floor, sea glass-inspired couches, and a chandelier that is designed to resemble bubbles forming from the crash of a blue wave overhead. The two-bedroom suite is, really, the star of the show here. One of its two bedrooms will house two queen beds, while the other, separated one will feature a single queen (which is how it can sleep up to six). It will feature a kitchenette and dining area, a bathroom with separate shower and two-sink vanity areas (so that the whole family can get ready at the same time), and, perhaps most interestingly, a “cool” picnic table for meals and some family time (which looks like it’ll be located in the bigger bedroom). Situated close by the picnic table is a shortboard surfboard, which goes with the colorful artwork and tie-dyed curtains to seal the beach feel. 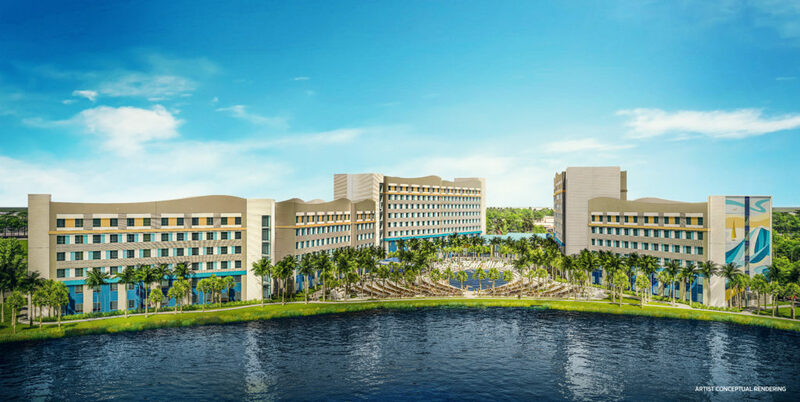 All that Universal has said thus far of Surfside Inn and Suites’s eateries is that they will include a poolside bar, a food court, and a Starbucks in the lobby. Oh, yeah – there’s also going to be pizza delivery, as well. But let’s pause for a moment on that food court. 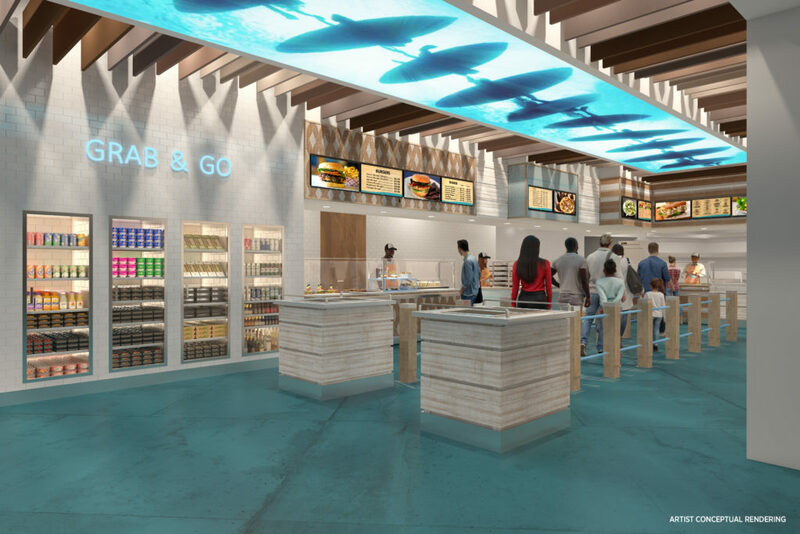 There will be the standard stations serving breakfast, lunch, dinner, and snacks, but the really noticeable item here is its decor: surfers will be attempted to ride the next wave above you while you wait in line. In addition to that surf-culture-worthy beach, expect to also find at Surfside Inn and Suites a surfboard-shaped swimming pool (but of course), a fitness center, a game room, and a Universal Studios Store. 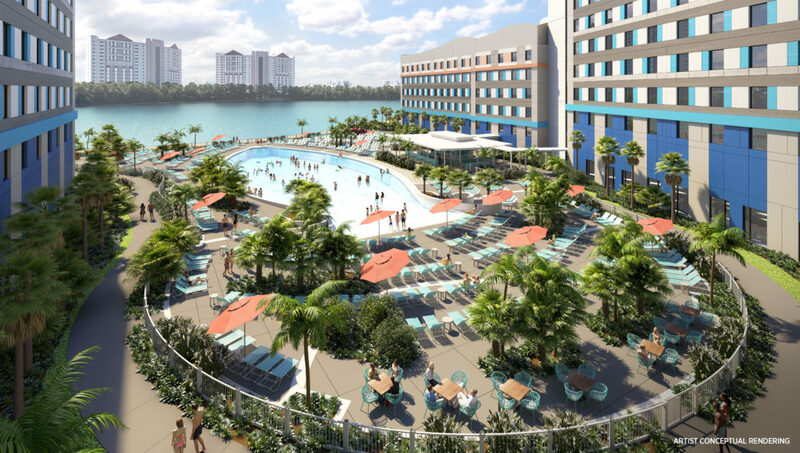 In addition, like the six other Universal Orlando on-site resorts, there will be such poolside activities as Ping-Pong and Connect Four. The water taxis that service all of Universal’s premiere and preferred hotels won’t, of course, extend all the way down Universal Blvd to Endless Summer Resort, meaning that shuttles will be the only method of transportation from the new resort to Universal Orlando proper – just as with the prime value hotels. 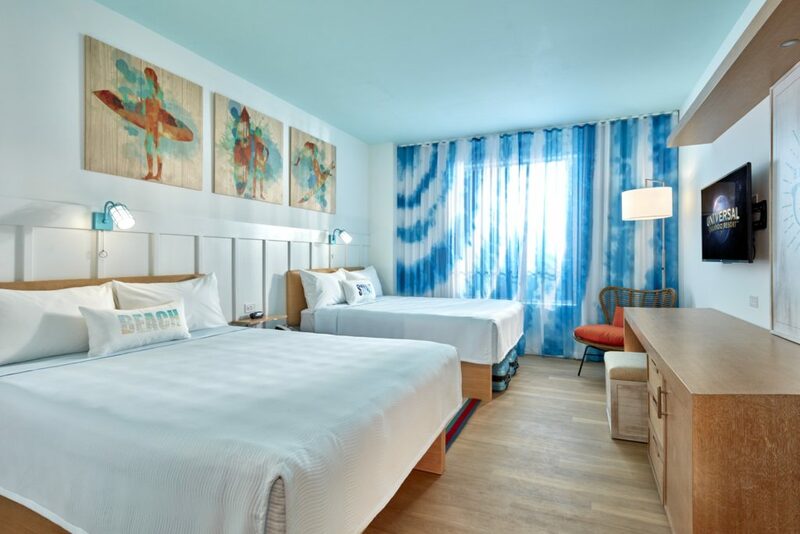 This newest value on-site hotel will carry the full complement of on-site perks that its two counterparts, Cabana Bay Beach Resort and Aventura Hotel, offer: Early Park Admission to both The Wizarding World of Harry Potter and Volcano Bay, resort-wide charging privileges with its room keys, and the ability to have packages sent directly to its rooms. Missing from this lineup, of course, are the complimentary Express Passes that the three most expensive venues (Portofino Bay Hotel, Hard Rock Hotel, and Royal Pacific Resort) brandish. Although both halves of the Endless Summer Resort complex are almost exactly alike in terms of their room types (and, as we’ll see, in their amenities, as well), there is a slight difference in their room rates, which we’ll compare using the standard rates (that is to say, without applying any kind of multi-night-stay discount, which is what Universal usually employs in its advertising): Surfside Inn and Suites’s standard rooms start at $85, while its two-bedroom suites begin at $131; Dockside Inn and Suites’s numbers are $89 and $136, respectively. What explains the barely-more-expensive prices at Dockside? Easy – the different times that the hotels open up. This means that you can expect Surfside’s rates to be identical to its counterpart’s in 2020. Since all (soon-to-be) eight on-site hotels are operated by Loews, they all feature the same cancellation policy: if you cancel your reservation six or more days in advance, you will receive a full refund. If it’s anything fewer than five days beforehand, however, you will be charged one night’s room rate, plus tax.